. . . I don't know what I'm doing here . . .
Dave Diamond KHJ Sales Sheet, courtesty Ray Randolph. Fresh from a smashing success among the rocks and rills of Denver, Dave brings one of the most imposing Pulse case histories ever assembled. No. 1 in Denver... No. 1 in St. Louis ... No. 1 in Knoxville; up to a 52% share in a 14-station market! This jolly blond giant, who now fully fills the 6 p.m. to 9 p.m. shift on Boss Radio, brings something else that will make your heart sing...a sheaf of testimonials from gratified advertisers in every market which has felt his impact. Dave's infectious good humor seems to have the facility of making even the tritest e.t. a grabber. Six to nine is a competitive time segment in Southern California radio...and Dave is a competitor that has never lost yet. He's here to sell! Dave Diamond (Sid I. Davison, Jr.) passed away May 5, 2014. He was 77. Although he was one of the first and original "Boss Jocks", he only worked for KHJ for four months, from April 1965 until August 1965, and he never returned to KHJ. He went to Denver and then returned to KBLA in Los Angeles where he found his niche. After KBLA folded, he joined KFWB, and just before KFWB went all-news he went to San Francisco and did Boss Radio quite nicely at KFRC. 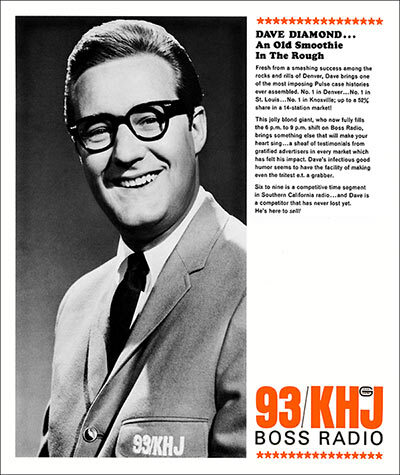 In 1971, he left Northern California and came back to L.A. at KRLA, then back to SF (as PD and jock at KCBS-FM) in '72, and then, back again to L.A. (KDAY in 1972, KIIS 1973-75), and was doing overnights at KFI from 1979 to at least 1982. That's when he moved to Howard, South Dakota, to care for his aging parents. Diamond taught mass communication classes at Buena Vista University in Storm Lake, Iowa, for several years, and would commute to Howard on the weekends. He moved to Spearfish S.D. in 1995 to teach at Black Hills State University. Diamond turned a defunct KBHU radio and TV station around. A professor emeritus in journalism, he continued to teach as his health allowed. This short, very noisy 'scoped aircheck of Dave Diamond was made at the very beginning of Boss Radio, the night before the Million Dollar Battle.